ASTANA – Global leaders in the international anti-nuclear weapons movement gathered Aug. 29 in Astana for an international nuclear disarmament conference coinciding with the 25th anniversary of the closure of the Semipalatinsk nuclear testing site. Participants discussed modern-day nuclear threats, next steps in the nonproliferation and nuclear disarmament movement and adopted the Astana Vision Declaration. “The conference was unprecedented success. I would like to highlight that the conference was of special significance for a very powerful and clear final document of 10 provisions, explaining an algorithm of actions for a more peaceful world. Different countries, including the Marshal Islands and Egypt, [as well as] international organisations worked on drafting the [Astana Vision] Declaration,” Deputy Minister of Foreign Affairs Roman Vassilenko stressed during the press conference at the conclusion of the even which took place at Astana’s Palace of Independence. The Astana Vision Declaration adopted at the end of the conference commended the Kazakh nation and Kazakh President Nursultan Nazarbayev’s leadership for voluntarily renouncing the world’s fourth largest nuclear arsenal, joining the Comprehensive Nuclear Test Ban Treaty (CTBT), establishing a Central Asian Nuclear Weapons-Free Zone and launching The ATOM Project to work towards a nuclear-weapons-free world and educate the world about the danger and long-term consequences of nuclear tests. 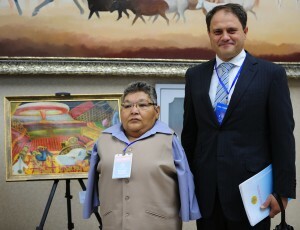 The conference was held in Astana to coincide with the 25th anniversary of the closure of the Semipalatinsk testing site, where the Soviet Union conducted more than 450 nuclear weapons tests. Those tests affected the health of more than 1.5 million Kazakhs and contaminated, in one degree or another, a land area nearly the size of Germany. To this day, the children and grandchildren of those exposed to the tests are often born with horrific birth defects and many of those personally exposed to the tests continue to suffer early death and lifelong health problems. Chairman of the Committee for International Relations, Defence and Security of the Senate of the Parliament of Kazakhstan Ikram Adyrbekov said the Astana Vision Declaration stipulates nuclear weapons tests have to permanently stop, all nuclear weapons must be banned and nuclear weapons free zones created. “Participants expressed their belief that every country will contribute to nuclear disarmament,” he added. 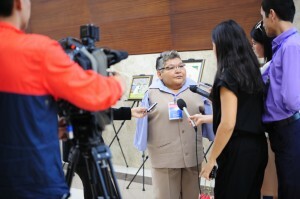 Kazakh President Nursultan Nazarbayevalso noted Kazakhstan’s ongoing role as a leader in the global anti-nuclear weapons movement. 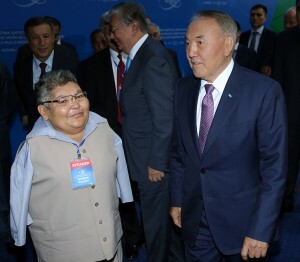 “We have initiated The ATOM Project (Abolish Testing – Our Mission), the essence of which is to unite all people for a comprehensive ban of nuclear weapons… I am convinced that the world community will see value in it and will use these seven fundamental pillars of Kazakhstan’s experience for the future movement towards a nuclear weapon-free world,” the President said when addressing the conference. The public can sign the petition by visiting The ATOM Project website, www.TheATOMProject.org. The online petition has gathered more than 300,000 signatures from more than 100 countries. 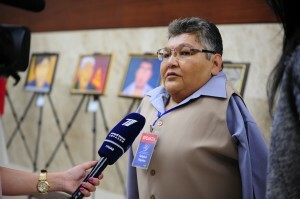 The diseases, tragedies, deaths and pain that Honorary Ambassador of The ATOM Project Karipbek Kuyukov witnessed in his life urged him to campaign against nuclear testing. He calls upon everyone to sign the petition to put an end to all nuclear weapons and their development. “The Cold War has ended but a new era of terrorism makes this call ever more urgent. Let us not give these terrorist madmen the chance to acquire any nuclear-weapons grade material to sow their carnage. This is a real danger and one that should spur nations holding or developing nuclear weapons to sit around the table of peace and negotiate a final, fair and secure end to all nuclear arsenals. The starting point would be for the remaining eight nations to sign and ratify the Comprehensive Nuclear Test Ban Treaty (CTBT),” Kuyukov said. Also, Nazarbayev announced that he would establish an international prize for contributions to global peace and nuclear disarmament before hundreds of diplomats, disarmament experts and world leaders at the conference.